It’s been a long time since I’ve posted anything on our blog. It seems to always go that way, but this time the several weeks in between entries had little to do with a lack of inspiration. Usually, it feels like I can’t think of anything interesting to write about or anything meaningful to share. This time, it was different. I’ve had plenty to write about. We’ve been to six amazing camps already this year and met so many new people – people I feel like I have learned so much from. We saw Alabama, Florida, Georgia, Tennessee, North Carolina, and a couple pass-throughs on the way. One camp we visited is experiencing a huge merger. Another had deep, rich history. One has a solo director as their only staff member. One serves inner-city youth FOR FREE. Another provides programming for folks with autism all year round. 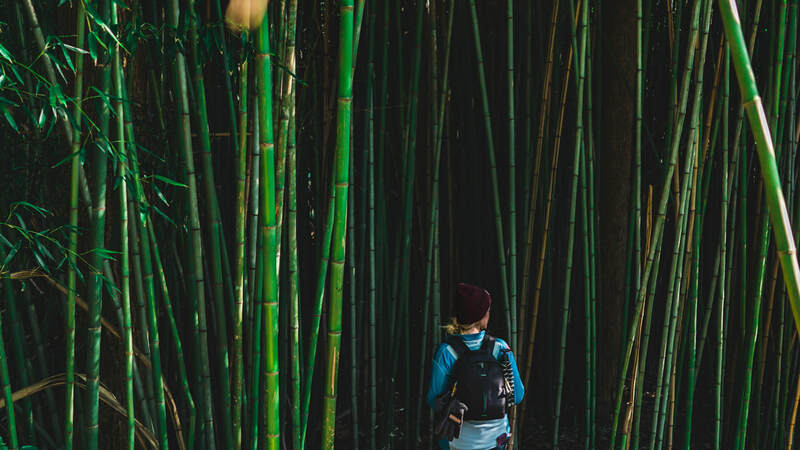 One had a BAMBOO FOREST, y’all! Every day is so full of experiences and growth and new relationships and making memories. You’d think I would have something to say about it all. But, to be honest (which I’m going to be because this is my blog and you chose to read it), I don’t feel like writing because I don’t really know what I’m writing for. Or maybe, who? Or maybe, why? At risk of sounding too existential or too much like an angsty teen – what’s the point of it all? Right now we are visiting our families back in Pennsylvania over the Easter holiday. We needed some time to be with all of our people here, but also to try and catch up on the intense backlog we have created for ourselves. I don’t know how to describe the way time has bent and warped on this journey. I often call it a whirlwind, but that phrase doesn’t feel quite right. It seems like every 10 days we start time over again. New camp. New people. New schedule. New experiences. New responsibilities. New footage. New work. New problems. New chaos. At some level, I know that time is passing and that life is happening all around us, but it doesn’t feel like we are connected to it. As though every camp visit was one whole lifetime and we have to be ready to do it all again next week. I’m learning that it’s possible for something so, so good to be so, so, so hard. So, we’ve been working diligently, trying to grind out all that we have to do without compromising the quality and purpose of our work. But at the same time, this semi-retreat has given us the time and space to really think instead of just swimming as hard as we can upstream. And as hard as it is to say, when we really clear our minds and think, we’re just not sure if this is where God is really calling us right now. I’ve thought for a long time that these thoughts were self-consciousness or doubt from the enemy. We’ve fought hard against them and called on close friends to pray. But still, we are unsure of our purpose. Right now, I don’t want to write anymore because I don’t see what difference it makes. Our videos are crawling out because we don’t know what good it does to post them anyway. Every time we post on Instagram, we argue over whether it is “good enough” or “genuine” or “on brand.” In those moments, I feel pretty far away from the heart of this project. Trouble is, I’m not sure I know what the heart of it really is. The why eats away at my joy. The for what distracts me from reality. And the God, is this what you want is the hardest question of all. It makes me nervous to write this publicly. I don’t want people to doubt us or feel betrayed. I also know how frustrating it can be to hear someone so privileged voice complaints. Friends, and even strangers, tell us all the time, “You’re so lucky! Your life is so amazing. I wish I could do that.” And here I am, writing a blog about how hard it is and how down I have been and how unsure I feel of it all. Boo hoo. I guess I just decided it was time to be honest. And the truth is, I absolutely love this journey. I would give just about anything to be able to do this forever. I love tiny living. Traveling this country, meeting so many amazing people and seeing new places all the time is insane. I still can’t believe it’s real sometimes. Being able to step into the story of each of these camps… I have tears welling up in my eyes just thinking about what an astounding gift that is. This life rules. But we don’t want a life that is full of all these great things and still doesn’t mean squat. And as much as we love this trip and all that we have gained from it, we didn’t want to be the sole beneficiaries. 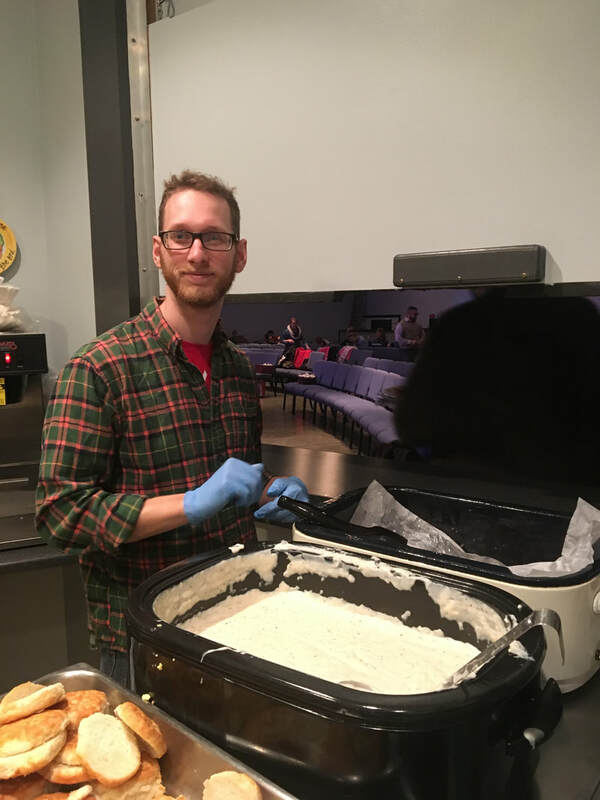 Sam and I promised that no matter what God led us to, as long as we really believed it was serving others and bringing Him glory, we would do it. 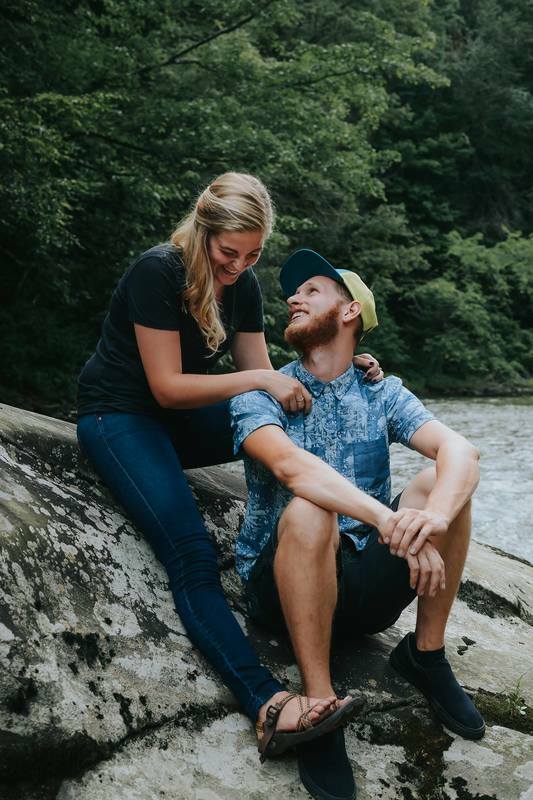 We prayed and prayed for God to show us a way we could use our lives and our marriage for something bigger, and Camp to Camp seemed like our answer. 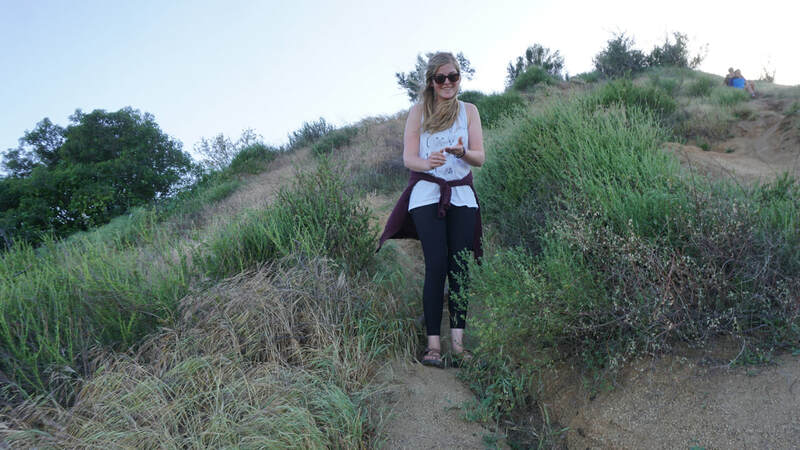 It seemed like such a big adventure, and I felt a bit like Moses, but we went. And here we are. 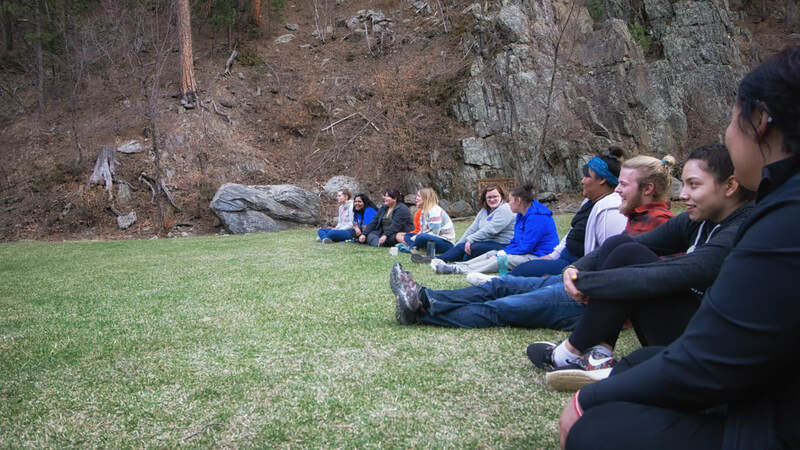 When we were at Camp Grace (previously mentioned as the camp that serves urban youth), we had so many great conversations, especially with their founder and executive director, Dave Pridemore. One night, over Mexican food, Dave taught us about his steps for following God’s call. 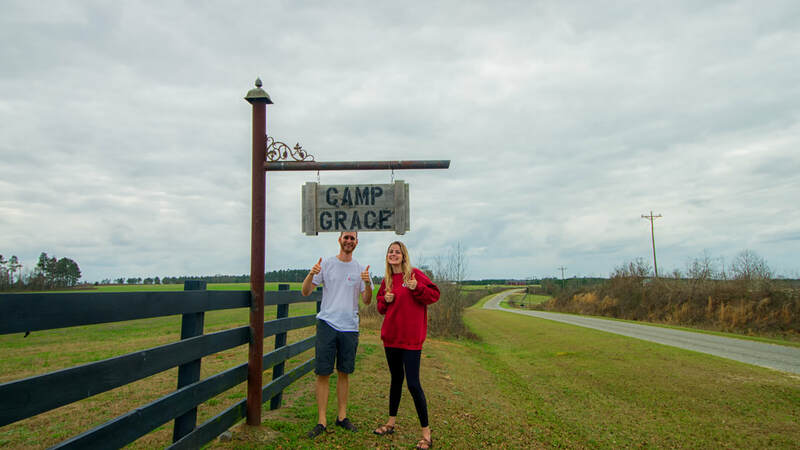 Dave built Camp Grace from nothing but a vision, and he wanted to share some of his “pro-tips” for following God in big, radical ways. In the middle of it all, he said something that stuck with me, if only because I’m wrestling with it so deeply. He said that when you get to the point where you have answered YES and launched into whatever the “thing” is, there’s nothing to say that thing will be wildly successful. Maybe it’s just me, but I don’t speak that language. Unsuccessful is a four-letter word in this house. If I can’t do it well, I don’t do it at all. How do I reconcile all the work, sacrifice, determination, and passion with a big fat failure? I haven’t yet figured out how to be okay with this little revelation. I know that God was telling me through Dave that it’s okay for Camp to Camp not be everything I thought it would be. But I’m stubborn. Bullheaded even. And I don’t like to do things that seem pointless. We aren’t quitting, so there’s that. We still have a schedule of camps planned out through the summer, including a giant trip out west that we’re not sure we can afford. We’re saying yes, every day. If that’s all we can do, we will keep saying yes. It doesn’t feel solid. It’s definitely a wimpy, wavering yes. But I have to believe that somewhere, in all of this, there is a purpose I just can’t see yet. I don’t have a great, feel-good ending for this one. I’d ask that if you’re reading this, you take the time to pray for us. We could use some renewed passion, and a heaping helping of clarity. I hope this inspires someone, even in a small way, to be honest about something you’re struggling with today. I’m a bit fed up with our culture of putting on a show, and I’d love to just have some open, honest conversations with folks who need a safe place to share. We’re all in this together. We are just over a year into this project, and currently visiting our 20th (!!!) camp in sunny Florida. We’ve seen a lot of camps and a lot of ways of doing camp. A plethora of ideas and creativity and things we never thought of have all been at our fingertips… So, you’d think we would have learned to stop saying the above phrase all the time. But, of course, we have not. I hope at least some of the other camp people out there are willing to admit that we always, inevitably, compare every experience to “our camp.” Regardless of the promises I made and ultimatums I gave myself before this trip started, I can’t help but go back to what I know. At 20 camps now, I have tried to take it all in, observe, and learn without bringing Wesley Woods into the picture, but I always manage to say (or at least think) something like, “Oh yeah, at our camp we had/did/made…” All this knowledge of other camps, and I am still stuck on that one, first place. I’ve noticed it in others too. 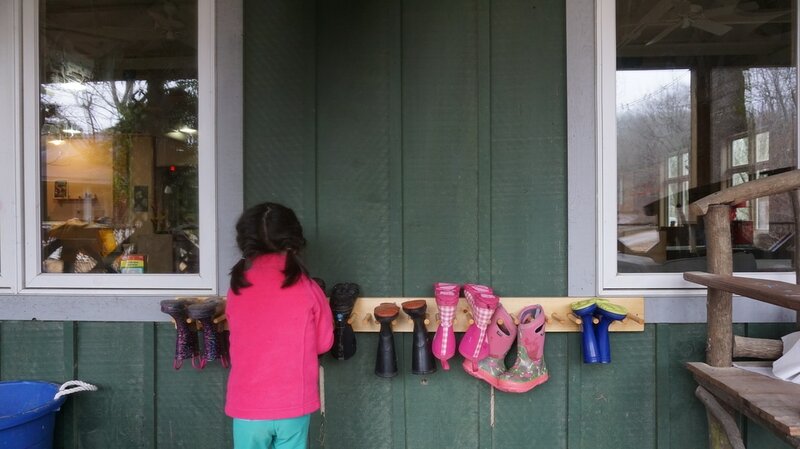 Even folks who have worked professionally at three, four, five camps seem to always bring up one as their compass experience. 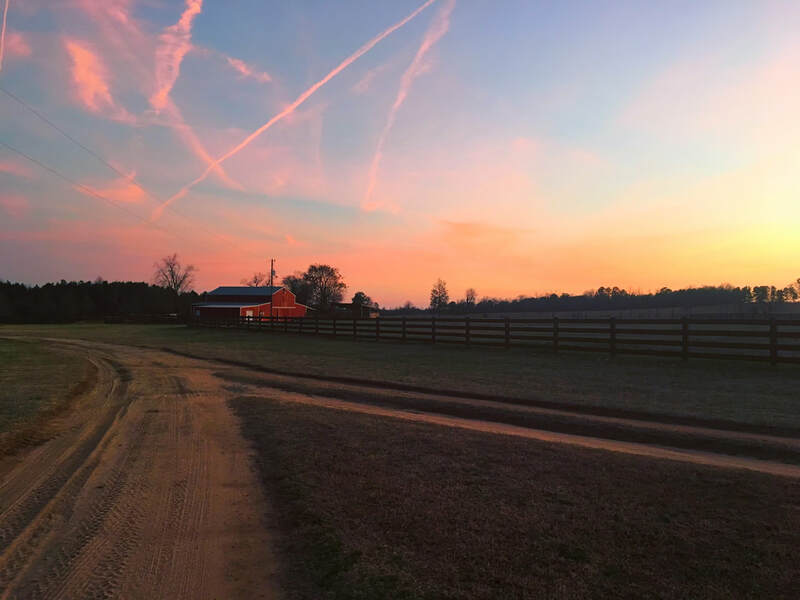 We will always view our home camp through rose-colored glasses. Or, you know, mud covered glasses. 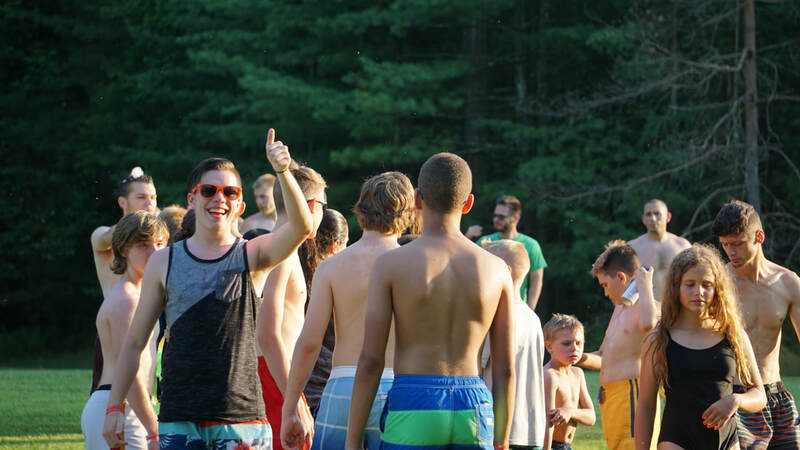 ​Growing up as a camper and then transitioning into a leadership role at camp is super weird. I spent a good chunk of my childhood thinking literal magic happened each summer at camp, and I assumed that working there must be the most amazing, stress-free, butterflies and rainbows job you could ever have. (Are you laughing? Good.) Everything about that place was perfect. The trees were perfect. The counselors were perfect. The camp songs were perfect. Every week I spent there convinced me more that God had smiled on that place and nothing ever went wrong there. ​Then I joined summer staff. I got a taste of the actual work that goes into making the “magic” happen. The trees sometimes fell in storms and were actually quite scary. The counselors were certainly not perfect – I was one of them! And those stupid, repetitive, nonsense camp songs were certainly not perfect anymore. But even though I had seen behind the curtain, I still thought the sun rose and set just for Wesley Woods. Knowing the “secrets” didn’t make it feel less like home, but quite the opposite. I was in on it. Part of the family. A piece of the legacy. It was absolutely the best job in the world – the best camp in the world – and I knew no place could ever compare. The transition from summer leadership to an actual career in camping is even weirder. Did you know camp is a business? With profit and loss and liability and marketing strategy? (Don’t worry – it was news to me too.) This magical, sparkling unicorn I had worshiped suddenly had hard edges and bills to pay. I’ll admit, learning that it costs money to share Jesus with people was hard for me. I’m still coming to terms with it, honestly. But learning how big and dynamic the world of camping really is pushed me to come out here and experience it all. There is so much more to camping ministry than that little picture I knew so well. And yet, I can’t get that picture out of my head. Try as I might to push it away, it’s becoming clear to me that the comparison game will never go away. My first instincts will always come from what I learned at Wesley Woods. And I think the real reason we hold on so dearly to those camps we love is that those are the places our lives were changed. That’s where we were when God said, “Hey you…” and we answered, “Yes God, I’m here.” The fact that we still work at camp means that something so profound happened in those early years that we couldn’t ever let go. ​I know there will always be a Wesley Woods sized hole in my heart that I will try to make every other camp fit into. But of course, they never will. So, I’m challenging myself and all my camp friends to make a little room. It’s hard to compare our precious things to those of others and see how wonderful theirs really are. But, I know that each camp we visit is a place where real magic happened for someone else, and I want to be open to learn from their story. 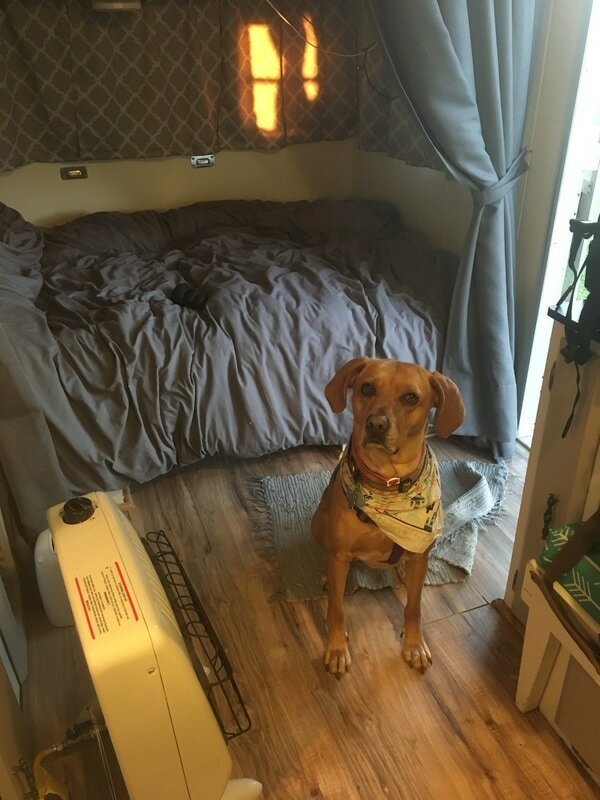 Tell us about your "home camp!" Things cost money. I didn’t want to be the one to break this news, but it’s true. Even if you take off in a camper to chase your dreams, you still have to pay for stuff. Bummer, right? 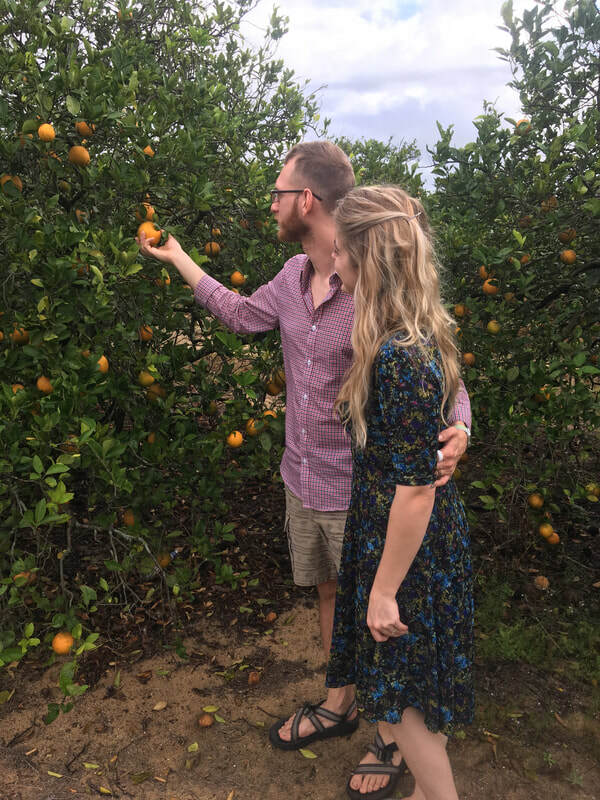 Choosing to make a life on the road involves a lot of “figuring it out.” At least for us, the biggest scariest part of the decision was figuring out how we would pay for it all. We knew two things for sure; we wanted to be able to serve each camp as we learned from them, but we didn’t want to be another burden to the camps either. So, we work alongside staff at the camps and try to become a part of their community, but we don’t really make money from it. 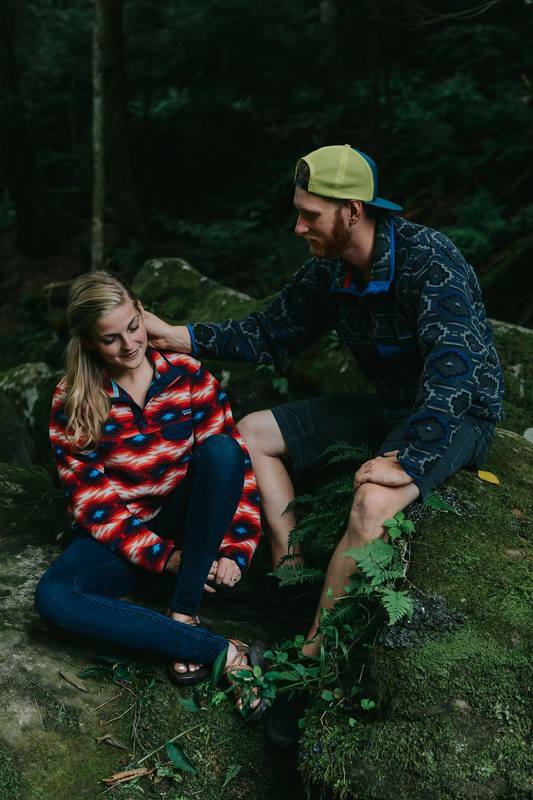 Back at home, Sam worked full-time at a camp and I worked a couple different part-time jobs. Obviously, we had to leave those when we started traveling. I will admit, it’s a pretty gut-wrenching experience to quit stable employment as 20-somethings with a ton of student loan debt. We had great support from our previous jobs though, and they encouraged us to pursue this calling. One of those employers actually worked it out so that I could maintain a remote position with them as an independent contractor. If the majority of what you do is on a computer or could be done online, there’s a possibility that you could take that job on the road. 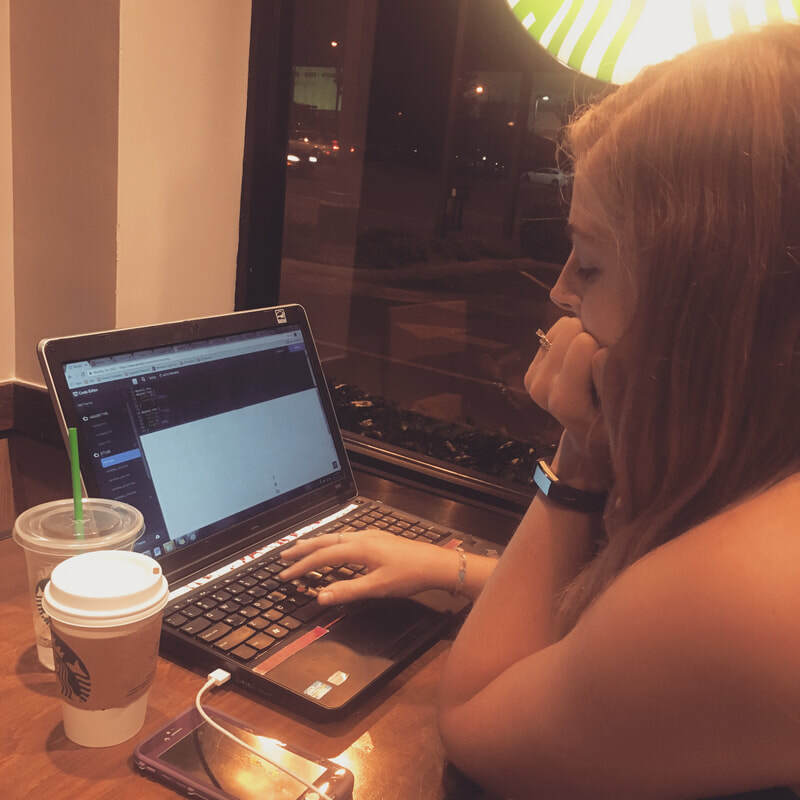 This has been a huge help for our journey, as I am able to complete projects when we have time off from camp or on travel days, and that steady monthly income helps keep us sane. brought to you by moments like this. I work in content and design. Sam is a photographer and videographer. Is that what we thought we would end up doing when we paid a ton of money for our degrees that have nothing to do with that? Not exactly. But life happens, you start out, you find out what you can do and what people need, and you make it work. I went to school for English and psychology (stop judging me I can hear you) and Sam went for social studies education. I was supposed to be a counselor. He was supposed to be a teacher. Long story short, that didn’t happen. But would we have been able to do this project if Sam was teaching full time and I was knee deep in grad school homework? Probably not. God prepared us for this in those years of figuring it out. I tried finding work writing and ended up finding a niche in nonprofit marketing. 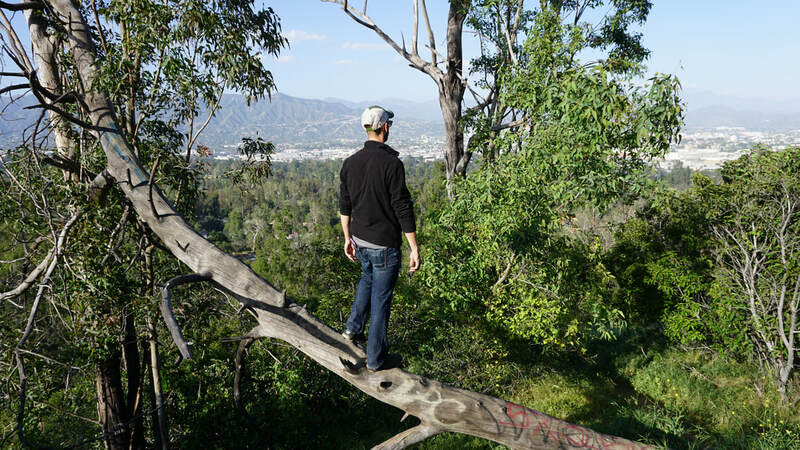 Sam took a summer job at camp and ended up discovering his calling to camping and love of media. As unexpected as those jobs were, these skills open us up to the possibility of finding work on the road. We’ve been able to freelance projects for a variety of clients, including some of the camps we visited. There are also plenty of online resources, like fivrr.com, that connect people who need things done with people who can do things. Having a creative skill is a huge plus for the “traveling marketplace,” and that can be what draws people to this lifestyle. Again, there is also the freedom to take on projects when you have time, and freelancing lets you try something new all the time. This income isn’t huge, but it’s still another great way to keep going. Assess your skills and consider how you can fill a need while (partially) filling your wallet. 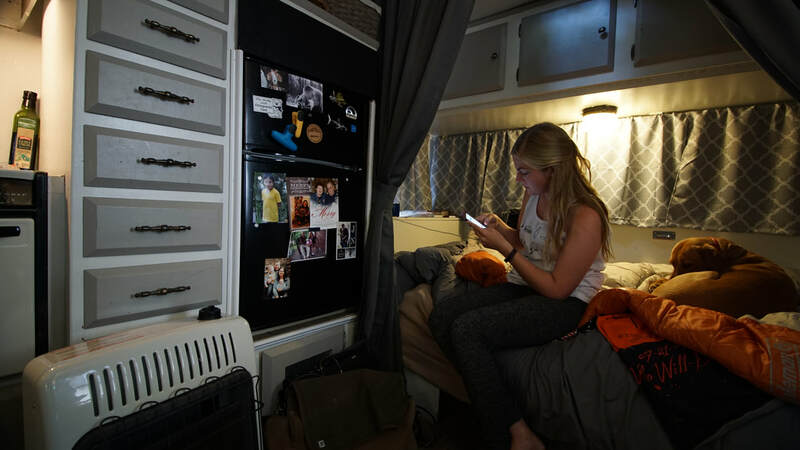 I would say most people who adopt the RV lifestyle utilize “workamping” as a source of income. 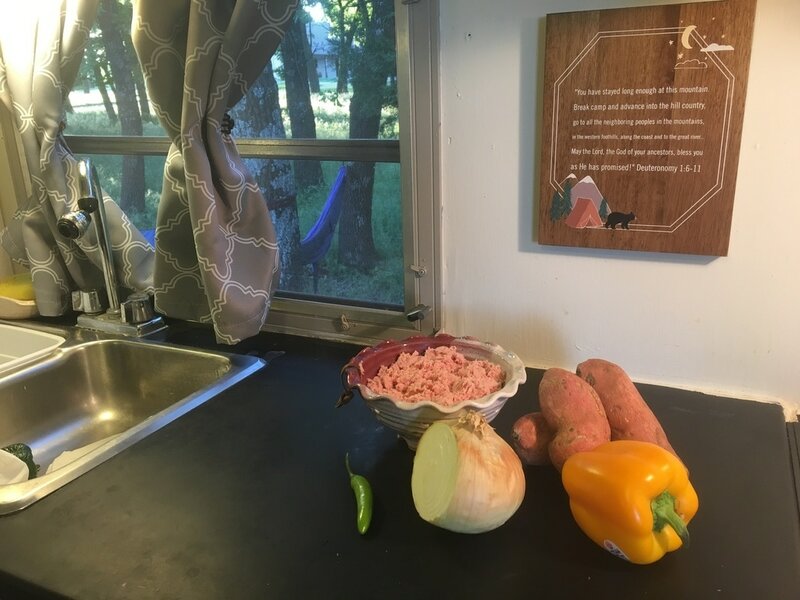 Workamping is short for “work camping” and typically involves working to pay for a spot to park your camper and the utilities that come along with it, with the potential to make a paycheck for hours worked beyond that. This can look like a lot of different things. 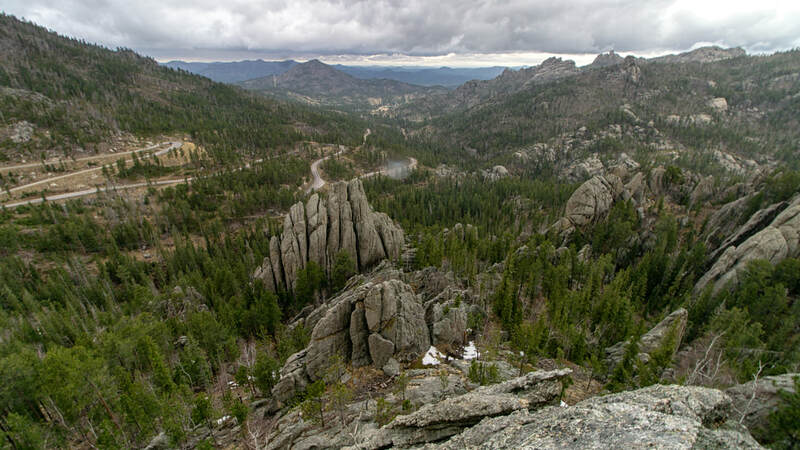 The most popular version is working a season for a campground or park, but those usually don’t pay enough and require too long of a commitment to be compatible with the focus of our trip. Our friends that do these jobs love them, but March – August is kind of an important season in camping ministry. We just can’t justify giving up that time. We do, however, work what we call “labor gigs,” which are shorter seasonal jobs that need manpower and hire workampers to get it done. We just finished our first season of the beet harvest, which is a pretty infamous job among full-timers. When you say, “we’re going to work the beet harvest” among workampers, those who have done it laugh and those who haven’t ask, “why? !” The harvest is certainly among the harder workamping jobs, but there’s a reason people go back every year. (Spoiler: It’s the money.) It’s a whirlwind job that happens in October (and some select employment before) in the northern midwest. We worked for American Crystal Sugar in Reynolds, ND and put in a total of 16 days. That is 16 consecutive work days on 12-hour night shifts. The work is not hard, but it is work. At the entry level, your three main jobs are signing in trucks, putting beets in bags, and shoveling dirt. Not hard, but not Disneyland. You will be tired and very ready for a day off by the end of it. You will also be standing outside for your entire shift, so that is a factor to consider depending on your physical limitations. This job also involves a lot of uncertainty. There is no way of knowing how many days you will work, what days you will have off, or when the harvest will be done. Overall, it’s the best money you can make in two weeks and we valued the experience. We were able to meet people from all different walks of life and it helped us practice mental and physical perseverance. These kinds of jobs are great for putting money away and can get you through for a while if you live frugally. This will be our second year as workampers for Amazon. 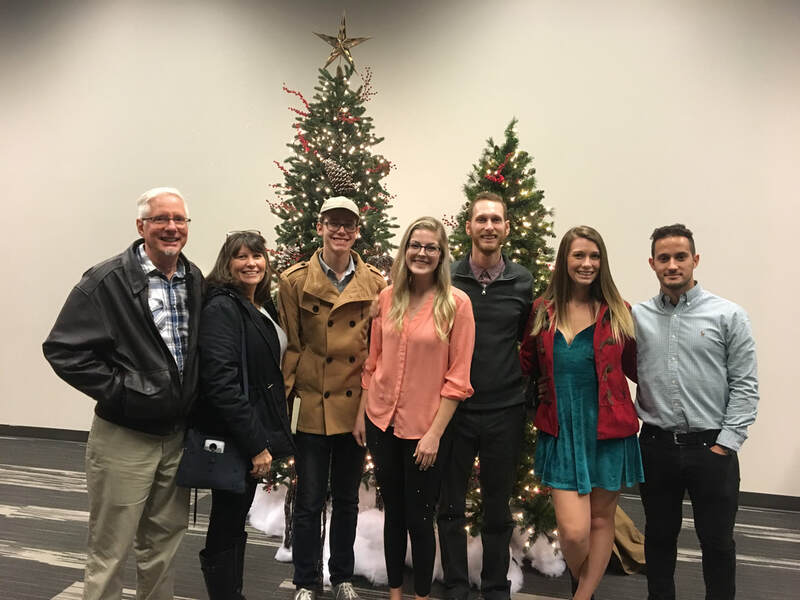 This job is called “Amazon Camperforce.” It helps support the Christmas season demand for the company, so they offer a lot of incentives to ensure they can hire the staff that they need. They pay for your campground spot, the wages are good, and they do make sure you feel like a valuable part of the team. 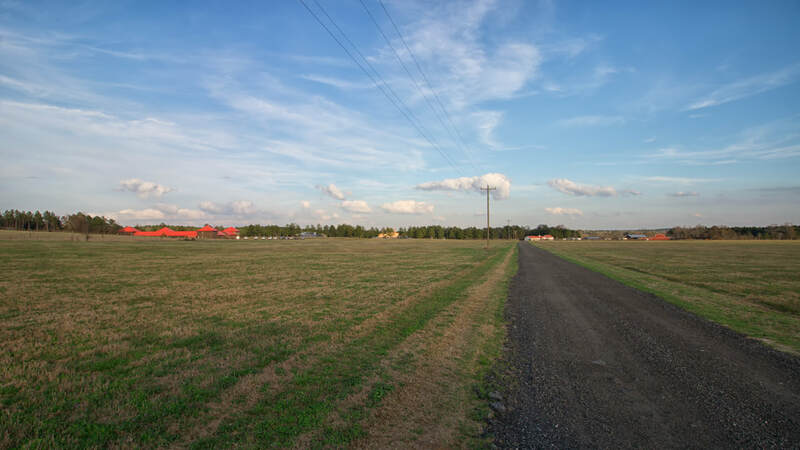 There are a couple different locations that take on Camperforce employees; we have worked in Murphreesboro, TN and will be in Campbellsville, KY this year. Amazon is a workamping job most people go back to each year. The days are definitely long and you will walk SO MUCH (10-15 miles a day), but you get what you put into it. It’s possible to make the work fun (I bet I can pick more items than you) and you do get scheduled days off (hallelujah), so you can easily make friends during your time there. We met people who we now consider lifelong friends working this job, so as tired as our feet and brains are by Christmas, we think it’s worth it. ​The hardest part of Amazon for us is all the time spent in your own head. As you work, there is nothing to listen to and not much time to talk to others. Not sure about all the other 24-year-olds out there, but I’m not great at silently letting my thoughts wander for 10 hours without spiraling into the occasional existential crisis. 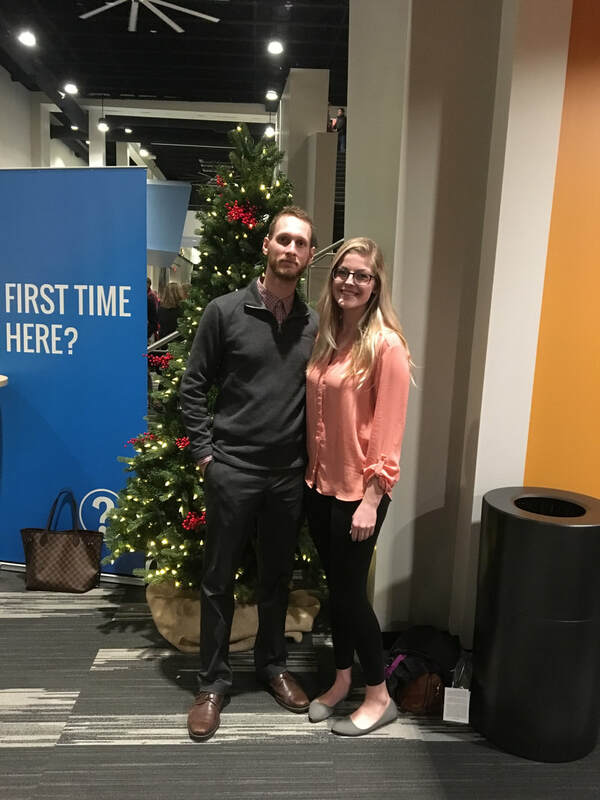 For a few reasons (mostly the existential crises), we decided to do six weeks at Amazon this year instead of three months. It means less money, but more brain cells. Still, between Amazon and the beet harvest, our workamping money is really what makes sure our bills are paid and we can eat. I am an ambassador for the health and wellness company Plexus. In addition to using and sharing the products in my daily life, I work as a team leader to provide support for the health journeys of my teammates. This is a passion that took me by surprise, but has been an unexpected financial blessing as we travel. It offers us a little extra money for unexpected expenses like breakdowns or campground fees. If there are products you believe in and love or a passion that you could share from the road, it’s worth considering how you could utilize that to support your journey. Patreon is an online resource that allows artists to fund their creative projects through the support of others. Essentially, it is crowdfunding for creatives. We use Patreon to give people who value our project and its goals a way to be a part of it with us. Ideally, people who value your work can discover it on Patreon and support your creative work through monthly giving. 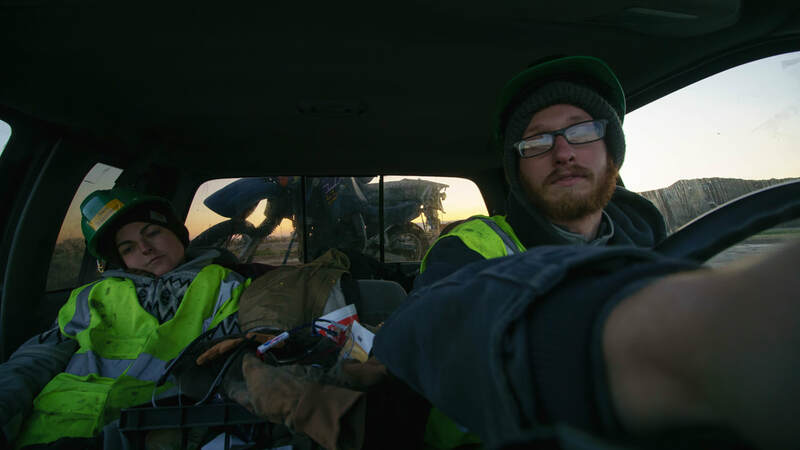 For us, our Patreon supporters physically get us from camp to camp by putting gas in our tank. If fully funded we would also be able to use this money to increase our production quality with new equipment. This is a more difficult tool to really reap the benefits of, but if you are creating something you think other people might care about, it’s worth a try. We haven’t really mastered the art of it (pun intended), but we sincerely love Patreon and its mission. We double love the people who have committed to sponsoring us. You guys are the best. As you can tell from this list, we kind of run in a hundred different directions to make this lifestyle work. It works for us and we love the ever-changing nature of our day to day. We are able to live a life we love, work toward something we are passionate about, see beautiful new places all the time, and still pay our bills like upstanding members of society. We started this trip out of a desire to share something we love, not to run away from anything. 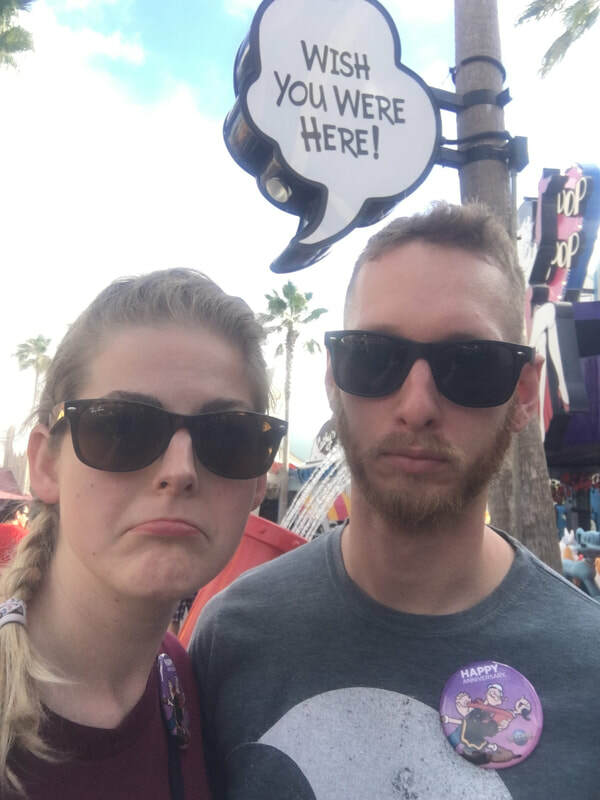 It’s important to us that even while we are on this crazy adventure, we maintain our commitments and pay our own bills… including our mortgage sized student loan payments. So, we do a little work here and a little over there and it all adds up to living a life we wouldn’t think was possible if we weren’t living it. But to be honest with you, even with all our jobs all over the place, we still couldn’t make this work without the amazing, generous people who have been a part of our journey. There’s just no way we could have fixed that exhaust manifold in Texas (and then again in Pennsylvania), or made it all the way to California(and back), or even had a nice computer to edit videos with after ours crapped out in Michigan. God has taught us gratitude in a huge way. Our friends and family at home have prayed for us and given us dollars we did not earn. Camps along the way have not only made sure we were well taken care of, but often provided for us financially despite our wish to not burden them. Thank you, thank you, thank you to everyone who has contributed to this journey. You keep us going. Literally. We aren’t your typical full-time RVers. We aren’t retired or simply working to fund our travels. While we have come to love this lifestyle and community, we set out on the road with a mission. We always come back to that purpose – to serve God and share camp. Especially when we doubt, we have to remember what got us into this mess. That is what keeps us motivated when the hours are long, we’re running in a hundred directions, and a relaxing Sunday at home sounds pretty darn good. In reality, we probably work more now than we ever did in our “normal” jobs, but there is something different about this. Something fulfilling, but at the same time full of longing. I don’t necessarily know when life will start to look “normal” for us. I’m not sure if/when we will have 9-5 jobs, a house, or a vehicle made in this century. But this work we are doing right now is working for us right now, and I’m okay with that. If you are considering making a living from the road or have any questions for us about how we travel full-time, please reach out! We would love to connect with you. If you have tips for us, those are certainly welcome as well. We can’t wait to hear from you! Reaching the end of summer at camp is a lot like running a marathon and finally making it to the finish line… and no one is there. No cheering fans. No trophy. Not even one of those cool banners you get to break through before you collapse. You look around, panting, and before you can reflect on what just happened, someone is shouting at you to get up and start running again. Get ready, friend. You’re not done yet. Where is everyone? What just happened? I still have work to do. Fall programming happens when? NOW? Didn’t we just have staff training? I think I was supposed to fix something… three weeks ago. Where did summer go? Did any of that even make a difference? Ministry is hard. It’s not hard for the same reasons that brain surgery is hard, though. I’m guessing here, but I assume brain surgeons think their job is hard. You have to know a lot about brains before you go poking around in there. There’s a pretty high level of skill involved. And if you mess up, well… It’s a hard job. But being in ministry is rough too because at the end of the day, you don’t get to walk into a patient’s hospital room and say, “It was a success! You’re fixed. Off you go.” There isn’t an endgame in genuine ministry. There is no “you did it right.” (I could probably come up with a “you did it wrong,” though.) In ministry, you make it to “post-op” and everyone is just gone. Did everything go okay? I think so. Were lives changed? Maybe… Will everything that happened here have a lasting effect on the campers and the staff and the volunteers and make them better people with better lives or at least do something to change the trajectory of their life toward Christ-inspired joy in some way? I’ve always struggled with this part of working in camping ministry. I thrive on praise. I love to hear that I have done a good job and to see the finished product of my hard work. That is not flowing in abundance in this line of work. Sure, people say thank you. Events happen without massive failure and that is good. But it’s almost impossible to know if you have really achieved the task you set out to do. Did I show that person Christ? Did I help them in a meaningful way? Did I make them feel loved, accepted, powerful, forgiven, and worthy? Did I change their story? Ministry is hard because it isn’t life or death work. It’s life or life abundant. It’s without Jesus or with Him. It’s “yeah, life is pretty good” or “I am redeemed, dearly loved, and part of the big picture.” And one of the hardest parts is never really knowing if you have done your job. Because your job isn’t really hire the summer staff, schedule the meetings, plan the activities, raise the money, make the nametags. Right? I had a past camper reach out to me out of the blue recently. She was part of a cohort of campers that have been a huge part of my life, so we’ve stayed in touch, but we usually just catch up and occasionally reminisce. I wouldn’t say I have an active role in many of their lives at this point. They know if they ever need someone, I will be there, and that’s good enough for me. Anyway, one of them sent me a message and said she needed to tell me something. I tried to remember the specific night she was talking about, but I truly do not. 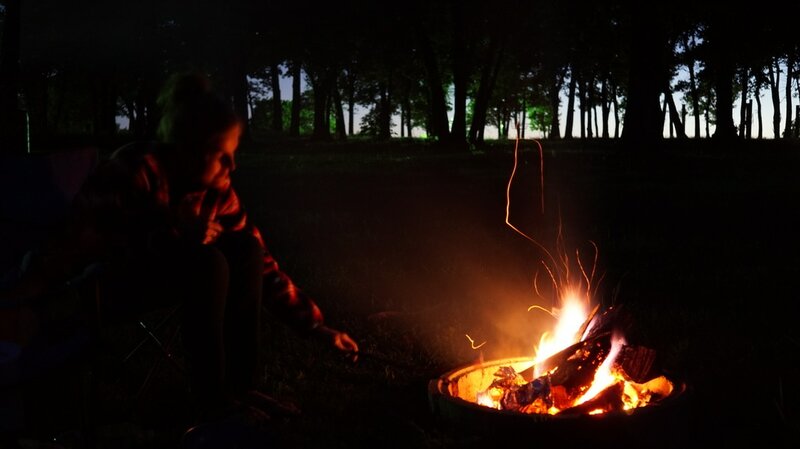 This camper remembers the night vividly. She told me what she had written and burned, how many times she had thought about it, and the impact it has had on her through the years. It meant something to her. Something huge. Y’all know I cried, right? God used me. That prayer that sits near constantly on my lips was heard. He did something in someone else’s life through me. Hearing that and knowing it for certain is a moment I now treasure. (I totally get why those moments are rare now though because that stuff will go to your head.) And it came at the perfect time. As we meet people along the road, my first goal is to encourage them in their ministry. I want them to know what they do is so important, and not to quit, and to know that they are making a real difference even when they can’t see it. But I needed to know that too. I’ll take that over a cool banner any day. We’re just about to wrap up our time here at Bay Shore Camp in Sebewaing, MI. Summer is officially underway and what we like to call “the chaos” has begun. We’ve been hearing from friends around the country who are getting their camp season started to, and it gets us so pumped about this ministry. Camp families are growing, burdens are being lifted, and people are experiencing the excellent joy that comes from God. This is the good stuff, y’all. 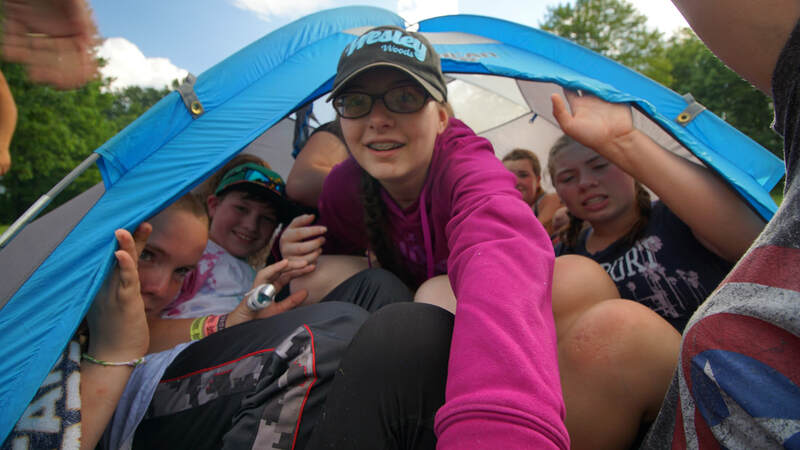 We are firm believers that a little bit of crazy is what makes the camp world turn. After all, what camp session is complete without a roll in the mud and something involving a rubber chicken? That chaos factor, the tendency for camp to be just one notch louder/sillier/bigger, is what sets the stage for kids to get PUMPED. How will we be different that the everyday? How will camp be a true experience instead of a week of babysitting? One huge thing you can add to your camp program to “amp it up” is music. I know. You’re giving up on me here. “Music? No kidding. Of course we have music at camp.” Hang in there. 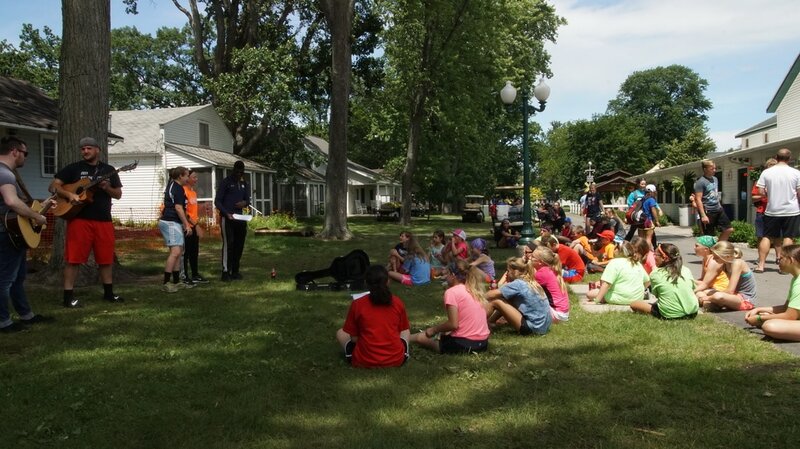 We know music is already an integral part of most camp programs, but the types of music and the ways they are used can make a huge difference in how they alter your camp experience. Having a good, eclectic playlist of “pump up music” at camp is like having a first aid kit on field game day. It’s a good idea. You are ready for any situation. Use it in the dining hall as a low backdrop to conversations. (Yes, it’s noisy. It’s fine.) Blast it while campers are coming into session and encourage dancing to get the moving before they have to sit still and pay attention. On the bus for an hour? Turn it up! Put every single game to music. Minute to win it games, capture the flag, I don’t care – put some Family Force 5 on that. I can’t explain what a huge difference this makes in the energy for both participants and spectators. The second way you can use music to “amp up” your program is a little less about energy and more about focus. We can (and should) use music as part of our daily programming at camp, but it is also an integral part of the spiritual development we teach. Lyrics are powerful. The songs we choose to use during times of study, prayer, and worship at camp are significant far beyond how popular or catchy they are. This is where we as camp staff have to choose wisely and prayerfully the words that will be on our campers’ lips. What an amazing, yet daunting, task. It’s my personal belief that not all Christian songs are worship songs. Let me be clear that this isn’t about “cultivating an experience” or manipulating our campers into a certain state of mind. However, I believe that songs from the first-person, which cry out to God or proclaim His glory to Him, are those that bring about the most intentional space of worship. 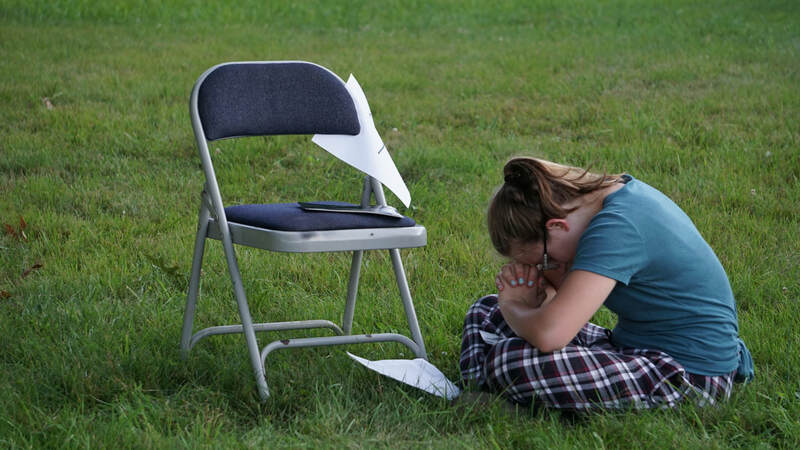 We teach our campers that prayer and worship are about talking to God and offering Him praise. Songs that allow campers to say “I love you, God” and “God, I need you” out loud give them the chance to see how those words feel in their mouths. Sam and I purposefully choose songs like this for worship, and then always instruct our campers to ask themselves questions about what they are singing. Do I believe these words? What do I have to say to God? What do I need to cry out to God or praise Him for today? 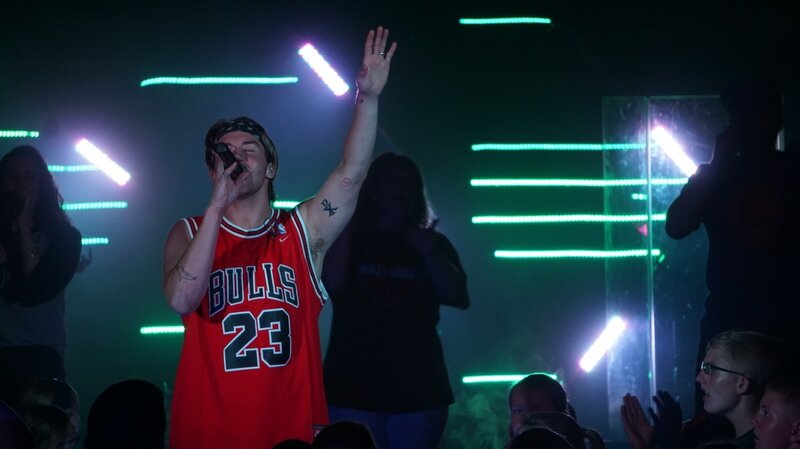 This has been amazing for our camp worship experiences and for the transformation of our campers. 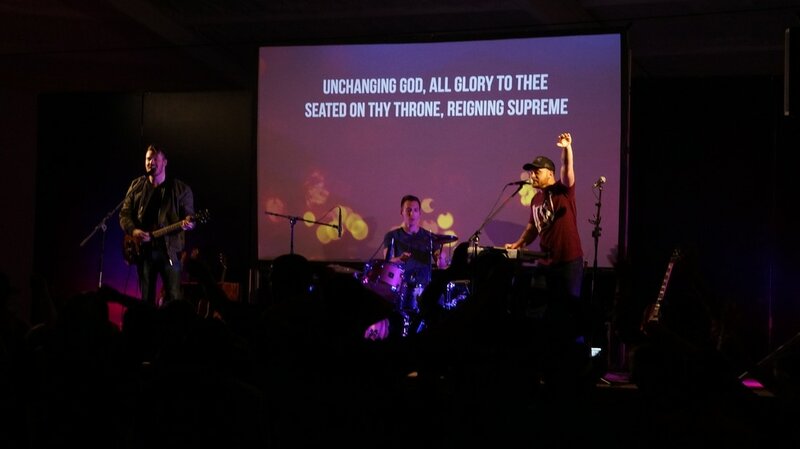 We may not always sing the super popular song of the moment or have extremely high energy sessions, but we can help our campers truly understand the meaning of worship. Then we will have a dance party. ​We’ve put together two Spotify playlists for you; the pumped up playlist is your go-to high energy mix, and the intentional worship playlist has some great songs for a transformational worship session. What songs do you think should be added to these lists? We're coming at you with a quick blog post today amid the chaos of THE FIRST DAY OF CAMP! This is game day. This is the big one. This is our Super Bowl. Camp people wait all year for that official summer kickoff and we LOVE it. This is your first impression – for Johnny and his mom and dad. From that first moment when their mini van rolls up and they start trying to figure out what this place is all about, it's on. They need to know where to go and what to do, but they also need to know that this week is going to be awesome, inspiring, safe, and beyond their expectations. It's a tall order, but we have a few pro-tips for camp registration day to help you get through to the fun part. As much as you can, integrate online forms that are sent to parents as soon as they sign their child up for camp. Depending on the registration system you use, this may be an easily integrated option. 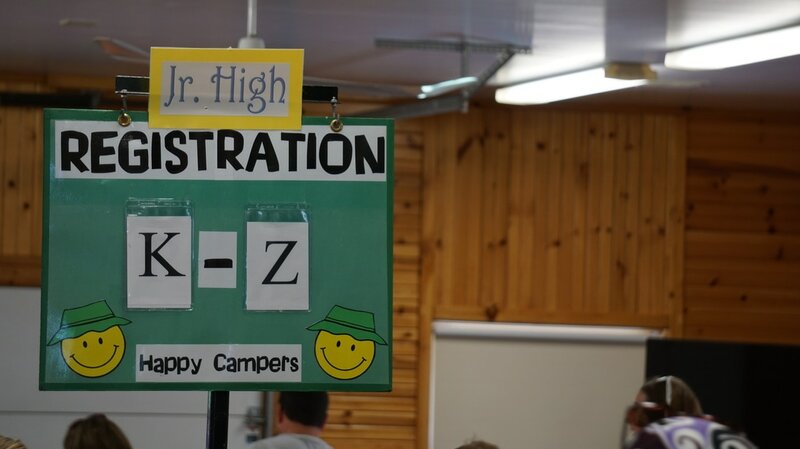 Make sure to assign a staff member to check up paperwork status prior to camper arrival; they can contact parents and ensure that everyone has their “stuff” in when they arrive to camp. For those inevitable few who still forget, have a station with a laptop or iPad set up out of the flow of traffic. There is certainly a cultural shift involved, but making it clear that information must be turned in online and prior to registration will revolutionize that first day flow. 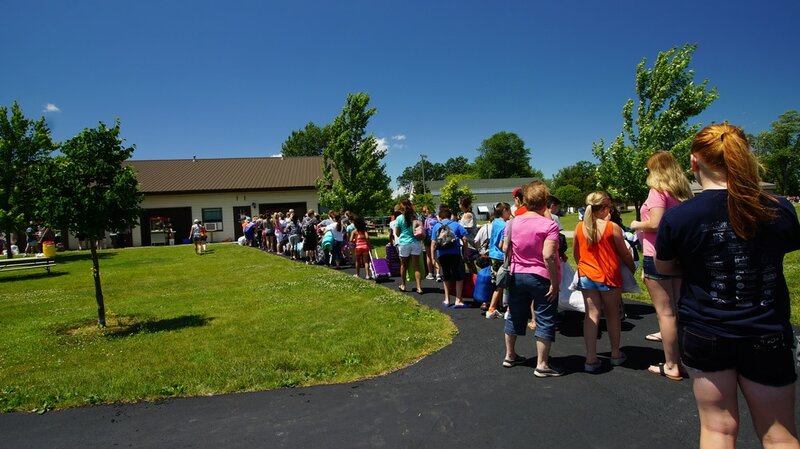 This isn't the DMV, people – it's SUMMER CAMP. We are about to put on the most insane week of the summer; you don't want the first moments of it to feel like everyone's slowly dying. Get your summer staff GOING. Get a staff RedBull fridge, offer incentives to the most enthusiastic staff member of the day, do whatever it takes. This should be a party. Get some music bumping, offer refreshments, let cheering and dancing abound – the more awkward, the better! Camper arrival sets the tone for the week. By ramping up the energy in those first moments, you're not only showing them that camp is going to be super fun, you're showing them that YOU are excited about this week too. Kids are like tiny human lie-detectors. They will know in an instant if your summer staff are not “feeling it” this week. Right away that sets the tone that the staff don't want to be here and if they don't want to be here, they definitely don't care that I am here or about what I need. This is bigger than excitement. This is about showing our campers that they matter to us and that we are genuinely psyched about them being here. Something we've seen recently that we really like is separating campers and parents (temporarily) early on in the process. There will be time for visiting the camp store and checking to make sure Timmy didn't forget his socks, but you can cultivate some independence right away too. Once you've made sure you have the completed liability forms, see step 1, have staff round up campers and their luggage in groups and head off to meet their counselors in the cabin. Parents get to go through the rest of the registration line without entertaining their 10 year-old, they can ask questions, and you can even offer a “parent orientation” for newbies. Meanwhile in the cabin, campers are feeling out the situation without mom or dad's hovering to add stress to the situation. Counselors get a chance to hype kids up and help them feel integrated so when parents come around for their tour, they see their child excited, adjusted, and part of a group. This is a totally new concept to us that we wish we would have thought of first. What better time is there to get kids signed up for camp than right after an amazing week at camp?! At registration, let parents know that they can lock in their camper's spot for next year when they pick them up. Send them home with the form or at least a flyer with the camp schedule so that when they are back at the end of the week, they are quickly and simply ready to go for next year. The camps we have seen do this require a short form and a deposit, but offer a free tshirt and a locked in price in return. Who doesn't love free swag? This step has a prerequisite that you know how to genuinely encourage and train staff. 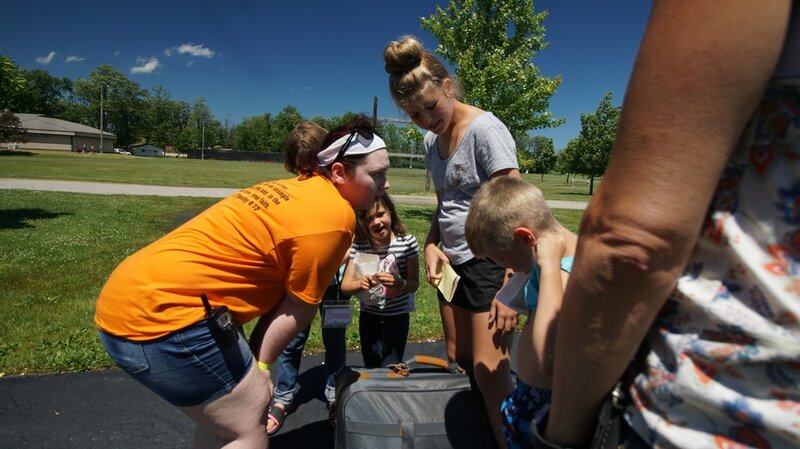 When campers and parents start arriving, everyone on your team should be committed to the mission and prepared to greet people with that mission in mind. There will be parents who barely even say goodbye to their camper, but there will also be moms and dads that don't trust these “kids” with their baby and still aren't convinced they are leaving without that baby in the car. Teach your staff to treat every encounter with a parent or camper as though that person is a first-timer. Even if they have done this for 15 years, they deserve to be paid attention to, have their questions answered, and to be confident about what's next. Stress the importance of interactions and relationships on this day. Every encounter is significant. Prepare your staff to make eye contact and be reassuring even when they are full of butterflies themselves. Teach them to get down on their camper's level and to speak professionally with parents. The more your team can prove they care in those first few moments of camp, the better everyone will feel about the week ahead. We hope you can incorporate some of these tips at your camp registration! 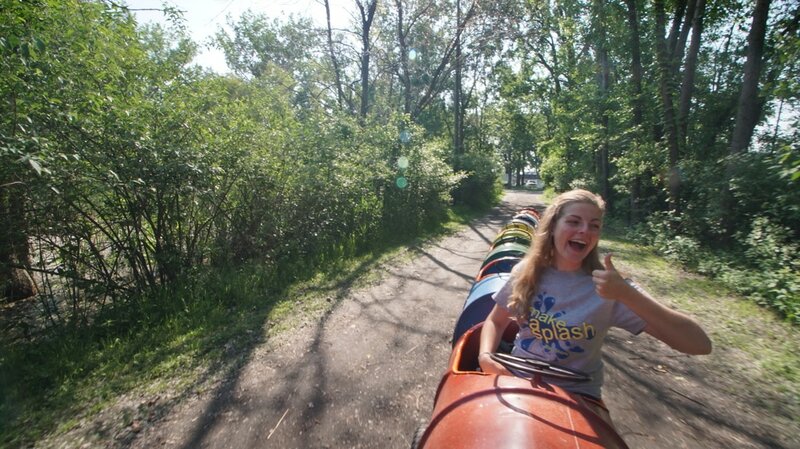 If you haven't already started welcoming campers this summer, get excited! The campers are coming and the hard work is all going to pay off. It's like camp Christmas! And even if camp is well underway where you are, remember – every time is someone's first time. We are pumped for you! May your summer be full of joy and your registration be a party. 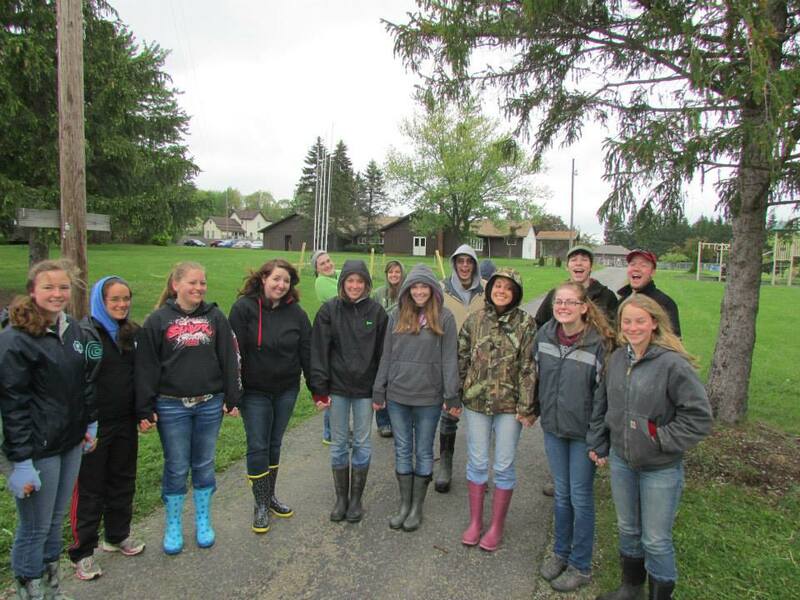 This weekend we were able to help with Family Fun Weekend at Bay Shore Camp in Sebewaing, MI. Every summer, the camp welcomes the community to come out, bring a tent or RV, and enjoy a weekend with their family – completely free. It’s an awesome outreach of this ministry, and we were so glad to be here in time to help out. So, the weekend wraps up Sunday morning with a casual worship service for those who are still around, hosted by one of the local churches. We showed up (late as always), sang a few songs along with a Bluetooth speaker, and looked out over the beautiful Saginaw Bay. Because I am still more of a 4-year-old than a 24-year-old, I sometimes have a little trouble paying attention in church. I know, I’m a sinner, but an hour is a really long time, okay?! This morning, the little girl sitting in front of me was experiencing the same difficulty, so we spent a good amount of time making faces at each other and kicking cottonwood “snow.” It was great fun. ​For a moment, I felt overwhelmed with the knowledge that this little girl, with her long blond hair and string bean legs, hasn’t really started the “life” part of life yet. 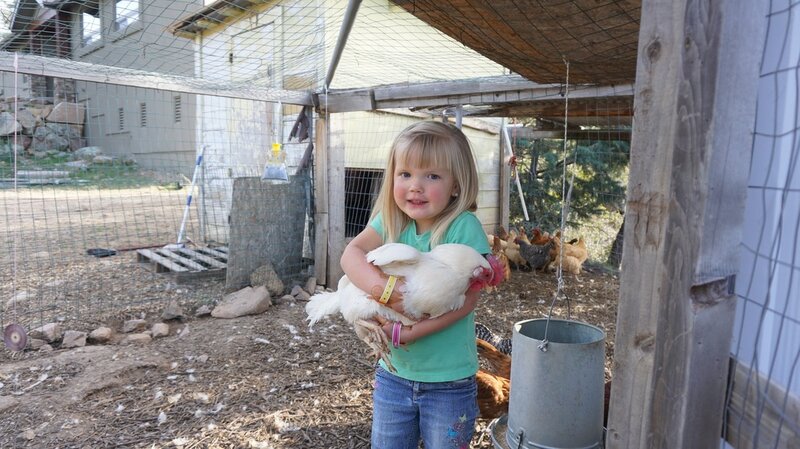 The pastor started talking about Gideon and about having a different view of yourself than God has for you, and I thought about this little girl. She’s not worried yet. She’s not ashamed yet. She doesn’t feel responsible, guilty, afraid, or worthless in big ways yet. You could tell by her silly demeanor and soft eyes that, for the most part, her life was more good than bad and more hope than sorrow. I was so happy for her. I started to pray for her. Nothing serious or specific, but just that God would use her life. I prayed that peace and silliness would last for her and that she would be guarded against darkness. 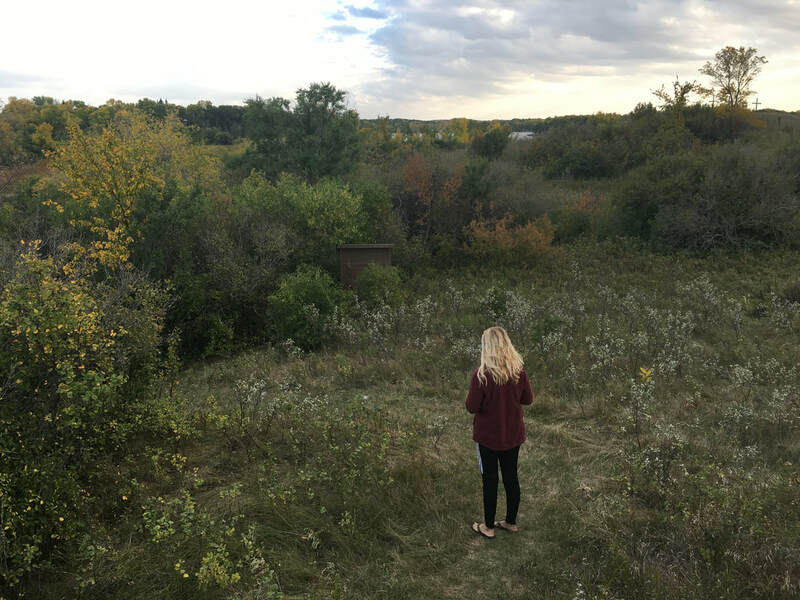 I’m still not sure why out of all the kids I spent time with this weekend I wanted to pray for her, but even now I feel so drawn to her serenity. I wanted to protect it and keep the world from squishing her joy. I asked God to give her strength and community, and to make sure she goes to camp. I know that we had a lot of high hopes for this project – and we still do. We want to achieve the things we set out to do, no matter how many times we have to revise the how. But we’ve also learned humility in big ways. There’s been a lot of letting go and a lot of saying “whatever you want, God.” It’s a really big, hard moment when the depth of your passion for something doesn’t match up with the world’s response to the work you do. But we can’t let it go. It matters too much. Through all the gray areas on this leg of the journey, one thing has become so clear. It was clear to me this morning, praying for that sweet little girl to have joy in her life, to know Jesus, and to have a community that supports, protects, and loves her. Camp is important. For kids who haven’t had to deal with “life” yet, and for people who have been hardened by it, camp can change everything. We love this ministry because it’s all about the good stuff – healing and joy and family and courage and Jesus. Camp exists for that one little girl with soft eyes, so that she can know she is loved and forgiven by the most amazing God and so that she can have honest relationships with people who will love her like Jesus. That’s too good not to share. This summer, I would love to share the stories of people who have been changed by camp. As we serve in the thick of camp season, I want to be able to write about what all the work is for and encourage other “camp people” that it’s all worth it. If you’d like to be a part of that, please send me your camp story and a photo to fromcamptocamp@gmail.com or share on our Facebook page. For me, the greatest joy of traveling for a living is meeting new people. We’ve been fortunate enough in our full-time RVing experience to make real relationships and what I hope will be lifelong friendships. 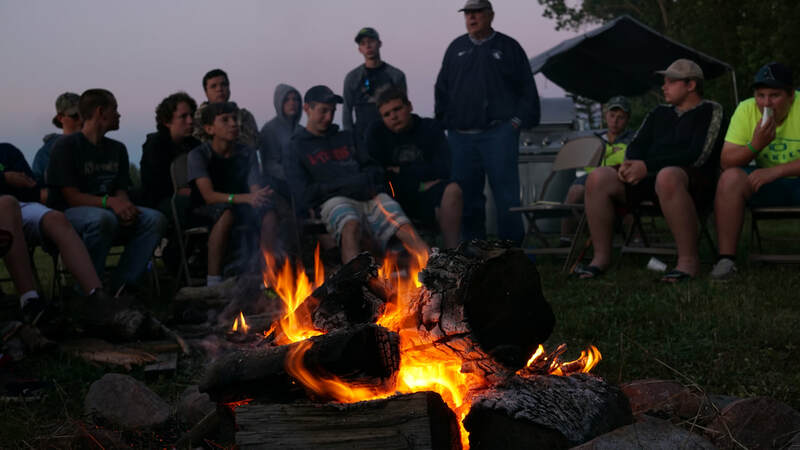 It feels as though each camp we visit adds to a family that is forming around us, cheering us on and uniting behind the desire to bring camping ministry – and Jesus – to all new people. It’s a special kind of opportunity to meet another person who shares your passions and endeavors. A few months ago in New Mexico, I got to meet Ashley. Ashley and her husband work in Christian camping, are raising two beautiful (and silly) children, and maintain a home that welcomes you in and says “you’re family.” Ashley and Ford were wonderful to just hang out with and get to know, and I have so much respect for people who open their home earnestly to others. Sam and Ford had a great time talking about woodworking (check out Ford’s insta) and Ashley and I bonded over things we love – blogging and food. ​I love the stories behind Ashley’s recipes. 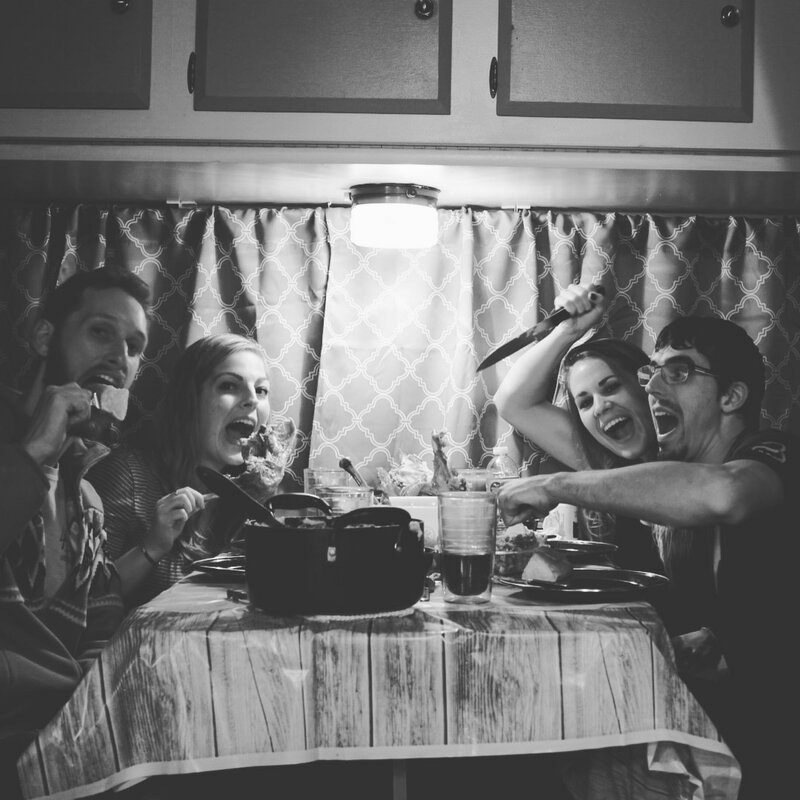 I agree with her that filling people’s bellies is a huge part of the “welcoming home” equation and that the best memories are made around a table. 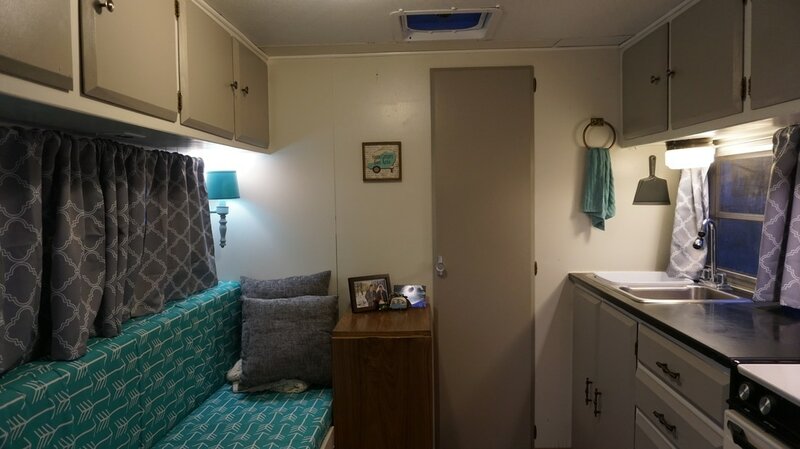 Living in a camper doesn’t have to be the end of that. You may be working with less space, a limited income, lack of an oven, etc. – but with a little creativity and some extra folding chairs, your home on wheels can still be a place of hospitality and fellowship. Ashley inspired me to try my hand at food blogging. 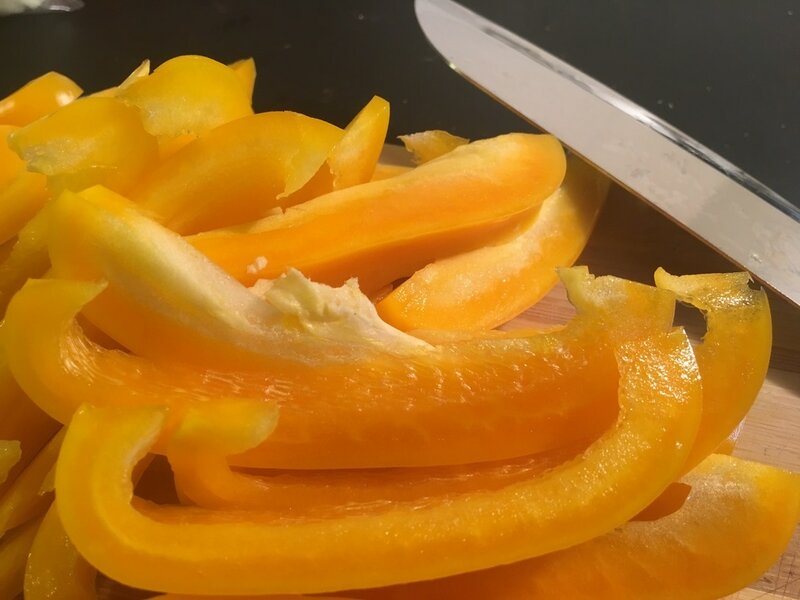 I wanted to try coming up with my own recipe and sharing it with others this way. However, I am NOT A COOK. I should not be trusted. I still can’t figure out why there are two utensils both called spatulas (WHY?). No one should take culinary advice from me. But I have a blog and a camera and no one stopped me, so here it is! Sticking with the “camp” theme, I wanted to make a meal that fills you up with memories of cooking over a fire, starry nights, and summer. I have always loved “hobo meals,” tin foil pouches filled with hearty ingredients and cooked over coals. As a kid, ground beef and potatoes was my JAM. As an adult… potatoes make me feel a little guilty. 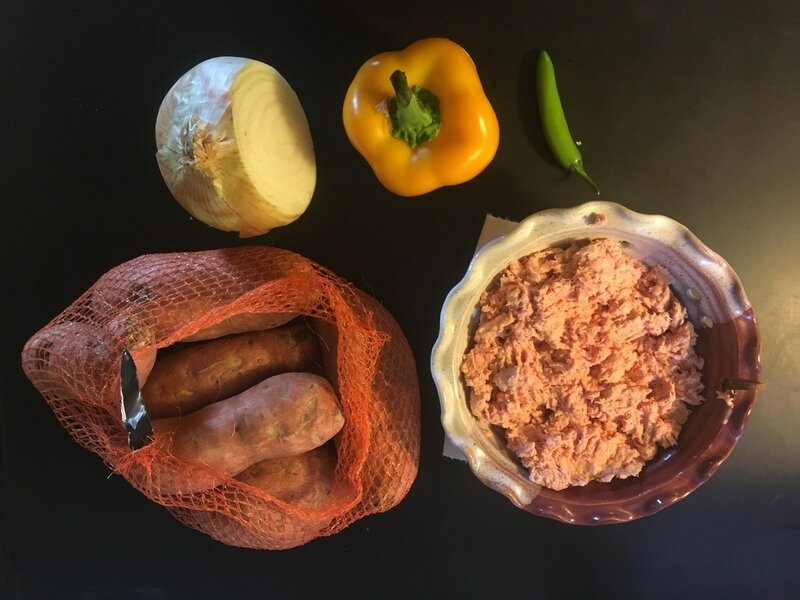 After a little brainstorming, I think I actually found a way to combine traditional camp food, entertaining guests, and healthy choices all in one recipe. It’s was like magic, friends. May I present, The Healthy Hobo. ​The heart of hobo dinners is basic ingredients that meld well together. 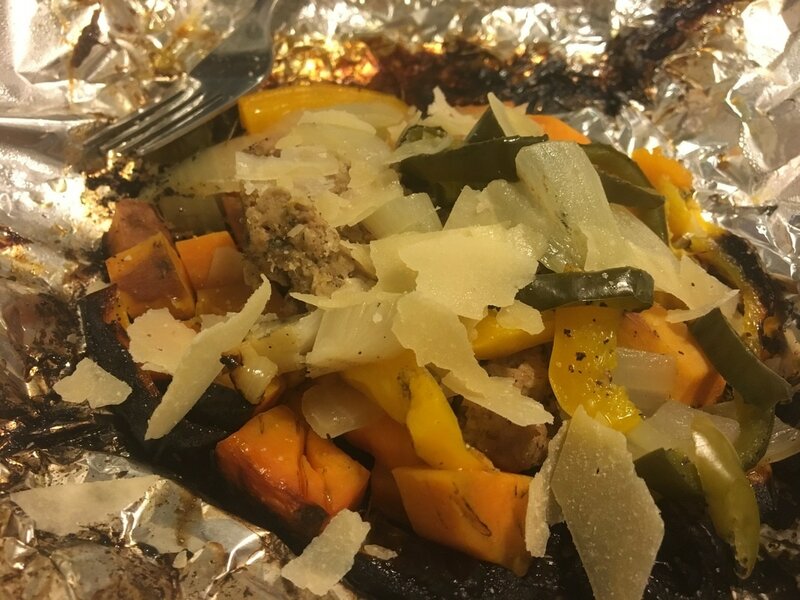 For this rendition, we went with ground turkey, sweet potatoes, onions, and peppers. I mixed yellow bell and poblano (and a teeny bit of serrano) because I am a pepper enthusiast, but really any pepper will work. 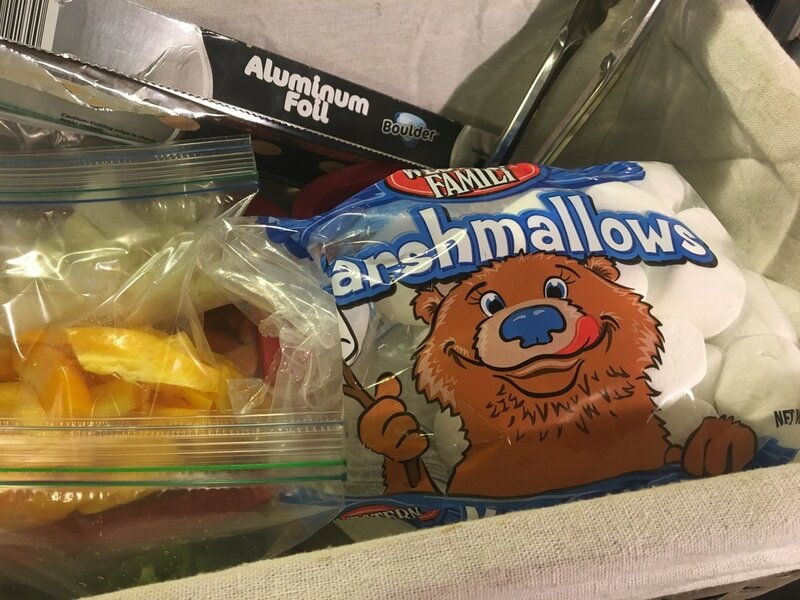 The ingredients can easily be prepped beforehand so you and your company can just make a foil pouch, scoop in the goods, and chuck it in the campfire. These foil pouch meals also work great in a toaster oven for rainy nights. 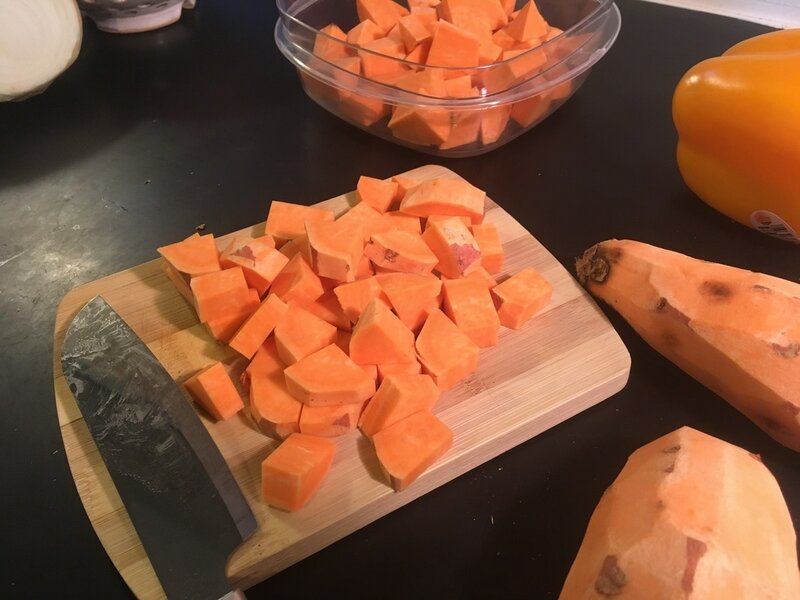 ​Sweet potatoes peeled and cubed. Onion chopped. *Am I getting these food cutting terms right?! 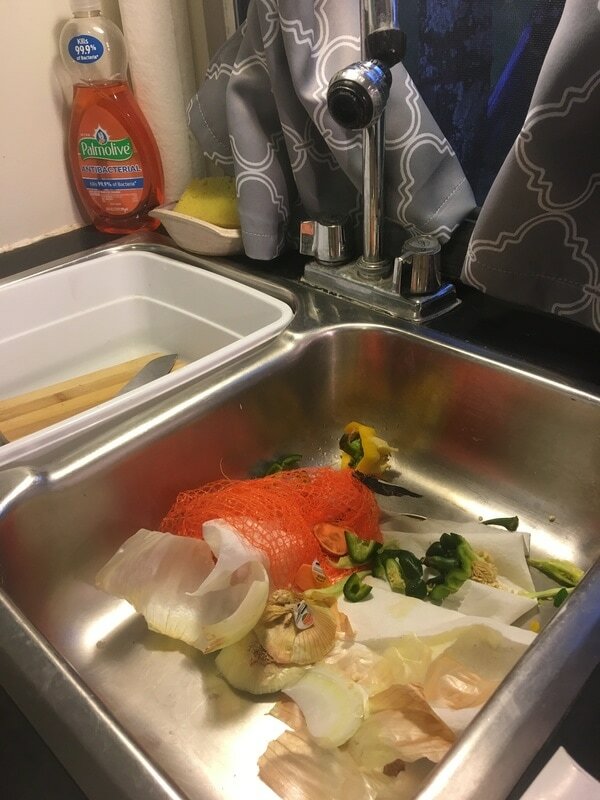 Just push all your garbage in the sink. Your husband will love it. ​And there you have it! Fill that basket up with your baggies, meat, foil, silverware, and tongs, and you have a beautiful bounty that you can present to your guests like a cornucopia. Very impressive. ​CRAP. DON’T FORGET THE MARSHMALLOWS. That fluff is important. When the party gets going, everyone can pick and choose what to fill their pouch with and nestle it into the coals. Be prepared – these will take a while to cook, but the conversations around the fire are the fun part. 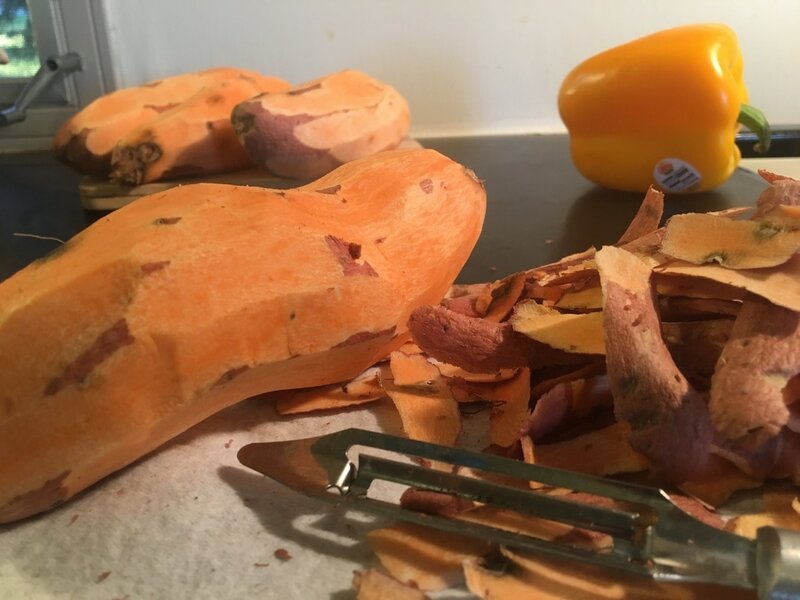 It’s good to flip the pouches every few minutes and peek inside about 15 minutes in – base the “doneness” on the sweet potatoes. When the pouch is good to go, just pop it open at the top and dig in – no need for dishes! We like to sprinkle ours with a little salt and some shaved parmesan, but you do you. Be sure to round out the meal with a roasted marshmallow (or 4) and a healthy portion of laughter around the fire. A health(ish) spin on the traditional camp hobo dinner. Feeds 4-6. 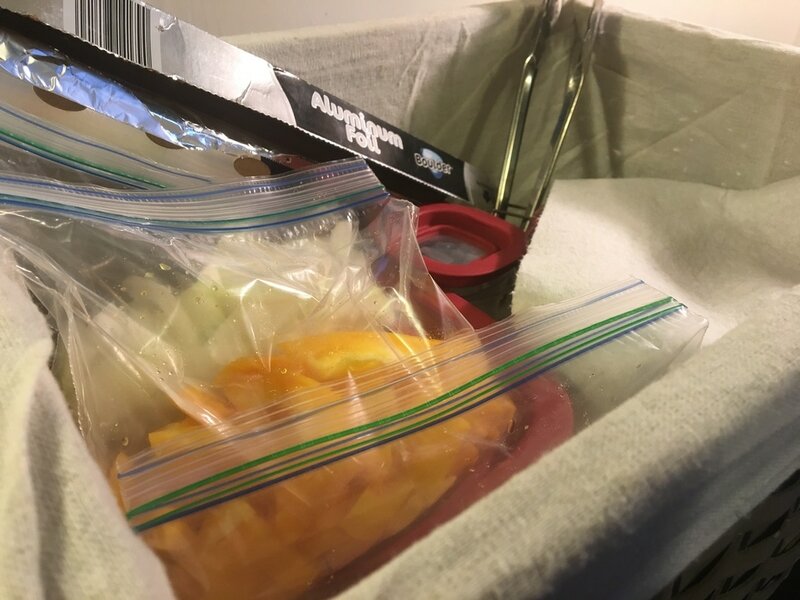 Prepare vegetables and store in baggies. Using two large pieces of foil, fold and crimp edges to create a pouch/pocket. Scoop desired amount of each ingredients into pouch and crimp top to close. Place on coals in fire/grill or in a 350 degree oven. Flip pouch several times during cooking. Check for doneness at 15 minutes. Pouches are ready when sweet potatoes are soft. Enjoy with salt, parmesan, (and a toasted marshmallow)!